There are several factors that account for excellent spotting and range finding. Accurate distance, readings, and clarity are all important and essentially non-negotiable for high-quality finders. The Simmons 4×20 LRF 600 Rangefinder is able to deliver on all fronts while fitting comfortable in one hand. 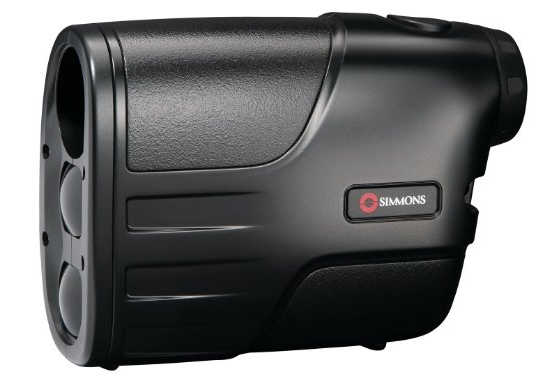 Featuring an LCD display with a clear read, the Simmons 4×20 LRF 600 Rangefinder provides distance that is exact within a yard between a range of 10-600 yards. The rangefinder also boasts 4x magnification and sharp optics that give the user a clear and crisp picture. The visual makes it feel like there is no distance between the user and the target while bringing subtle details into focus, and all on a 9-volt battery power supply with the push of a button. Superb clarity and instantly accurate distance are only two of the rangefinder’s best qualities. While it’s crucial that a rangefinder be accurate and clear, it must also have functional utility. A star-gazing telescope can provide great magnification, but would be extremely cumbersome to carry and set up during excursions. The Simmons 4×20 LRF 600 Rangefinder is a great adventure companion at under 10 ounces and less than 6 inches at its longest. It’s compact size makes it easy to take anywhere, and since it fits in your hand it is always ready for use. Harsh conditions were kept in mind when building this rangefinder as it is designed with a durable, water-resistant housing that stands up to nature’s hazards. Rounding out the list of impressive features is the affordable price which is marked below $150. The Simmons 4×20 LRF 600 is a great rangefinder, but it does have its limitations. The visual quality is impressive, but in distance intervals. It’s suggested that spotting wildlife such as deer is best around 200 yards while the 600 yard capability is for looking at reflective objects, like the roof of a car. For trees and shrubbery, the effective range is around 400 yards. * There also isn’t any protection for glare or fog which can make viewing difficult while in adverse conditions. As with any rangefinder, finding the distance for the correct object can sometimes be tricky. Although very accurate, this rangefinder can sometimes give the distance to something that is between the user and the intended target. This can be frustrating, but it may have more to do with human error than performance shortcomings. For what you pay for, this rangefinder is great. A lot of its strength comes from its simplicity. It doesn’t accommodate a lot of peripheral features, but that allows for the ones it does have to truly shine. The one button design streamlines the range-finding process and provides a simple, easy-to-read display. The optics are clear and the picture is poignant which makes this rangefinder great for viewing as a secondary focus. The price purchases a lot of quality for relatively little investment and allows the user to better understand what his needs are. Perhaps the best feature of the Simmons 4×20 LRF Rangefinder is the compact size and weight. It’s easy to carry and maneuver, and the durability means that it doesn’t have to be neatly packed away in the carrying case at all times. On the course or in a tree stand, this rangefinder is very reliable. It takes the guessing out of the equation and replaces it with quick and accurate information, which can make all the difference during that big hunt. There are other rangefinders with more features, but they also come with much price tags. With this Simmons rangefinder, it’s as easy as point and click.